The sink didn’t work. I had to wash my hands with bottled water. There was black hair in the bathroom — I am a red head. The neighborhood was seedy, and the room was loud. Not the best hotel in town. Has many misleading advertising ads in which they offer you something and once you get there they actually charge you for them. This hotel is not even one block from the Clinton station of the Blue Line (from ORD) and is very secure, even late at night. If you are walking to Union Station (Amtrak, commuter trains), you go up Clinton Street for about 3 blocks and turn right on Jackson street and use the entrance to the Grand Lobby about a half a block in on Jackson. This is about the ONLY hotel that is in walking distance to Union Station. The rooms are typical for a Holiday Inn and the internet WIFI is free and fast. The security guard was so helpful in telling me the safest way to walk to Union Station. The late night and early morning staff are friendly and helpful. The bed was comfortable and the hotel was quiet. We enjoyed our stay at the Holiday Inn in Chicago. My son lives right across the street so the convenience factor was wonderful. There is a subway stop right across the street and the bus and train station are close as well. I can't say enough about how friendly the staff was. They even sent me texts to ask if we were satisfied with our room. Hotel was convenient to public transportation . Staff was excellent. I would recommend this hotel to friends. This hotel is super convenient to the blue line if you are traveling to/from ohare. The front desk staff was friendly and offered us coupons for free breakfast. The breakfast has lots of hot and cold options but they also have a menu to order off of if you prefer that. Hotel seems old but they've managed to keep it clean. It just felt a bit warn out. Lots of places to walk to if you don't mind putting in a few miles over the day. Helicopters doing something construction wise were loud as was nearby traffic. We'd stay again as the price was reasonable and location convenient. Eating, entertainment, train. Staff very helpful. Room comfortable. Needed grab bars and a little more room in bathroom for handicapped. The room was surprisingly quiet for being on a busy corner. The hotel is easily accessible from the airport and the train station. Don't let the map fool you into thinking the hotel is a 3-5 block distance from the station. It is literally just outside the train station. The hotel staff is very accommodating and the room is very clean. There is a bar in the hotel that serves amazing french fries and a restaurant that serves great pancakes for breakfast. In addition, the hotel is a great place to stay when you are doing campus visit to University of Illinois-Chicago. It takes 3 minutes to walk to the campus. You can also walk 5 blocks and you are in downtown area. Regardless, the train station takes you everywhere in the city. In short, I had an amazing time in the hotel. My room oversees the snow covered city and its a great view to wake up to while you sip your morning coffee. Great friendly staff. Bottled water on arrival was very nice and refreshing! Great location and close to everything downtown. The room was extra clean and the valet parking was very convenient. Location is ok. Was a tad noisy from traffic. The divvy cycle stand is close by. Makes the location more appealing. There was a lot happening in town with NFL draft on, so lots of people about and I felt safe. I chose this hotel because of its location near the Amtrak station downtown. The location was excellent and the hotel met all of my needs. Everyone at this place was so nice and went out of there way for directions and anything we needed. It is 2 blocks from amtrak station. It is just a little to far away from michigan ave and navy pier for walking. It is a safe area. The pool is really nice. Only downfall no refrigerator in rooms. Took a taxi to amtrak station to go home because it was early and kids didn't want to walk. Blue Ribbon taxi #3105. The guy ripped us off charged 6 dollars for two blocks. We went to Navy pier and michigan ave for 8 bucks. I let the guy know he was taking advantage of us so beware of that Taxi! This is an ok hotel and location is nice. But even for the good price, prepaid deals be prepared to pay additional deposit hold for 'possible incidentals' when you arrive to this hotel. Contrary what the hotel advertises on their website (says for every room no deposit required). Of course you will get the money back few days later after you check out of the hotel. I will choose another hotel next time that's upfront with their fees, on principal. Friendly staff and nice rooms. Only downside is no mini fridge. Room was clean , some noice at nights. Metro Blue line in from of the hotel. Any atractions close. No breakfast. 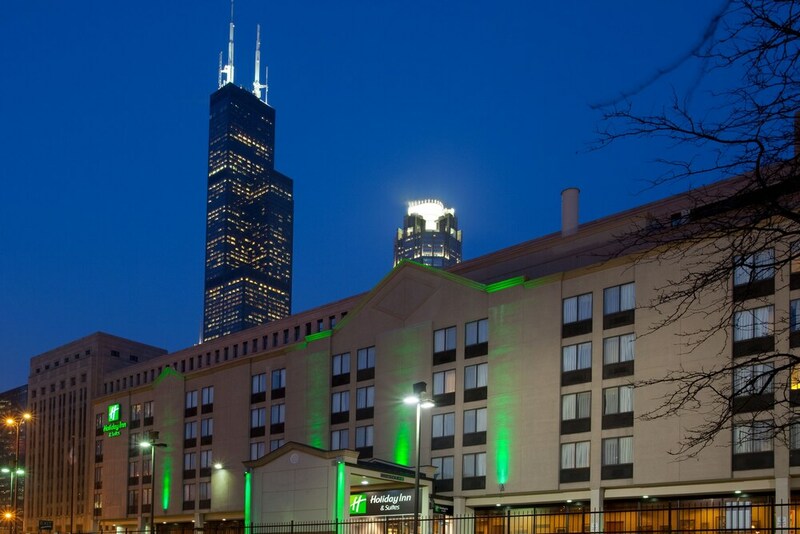 Holiday Inn & Suites Chicago - Downtown places you in Near West Side, within a leisurely stroll of popular sights such as Willis Tower and Skydeck Ledge. This 145-room, 3-star hotel welcomes guests with conveniences like an outdoor pool, a 24-hour health club, and free in-room WiFi. Enjoy a bite to eat at the hotel's restaurant, or relax with a drink at the bar/lounge. Savor a meal from the comfort of your room with room service, or get a quick energy boost at the coffee shop/café. For your convenience, a buffet breakfast is served for a fee on weekdays from 6:30 AM to 11 AM and on weekends from 7 AM to noon. Guests can expect to find free WiFi and 32-inch an LCD TV with digital channels. Pillowtop beds sport premium bedding and pillow menus, and the bathroom offers a soaking tub, a hair dryer, and free toiletries. Other standard amenities include an iPod dock, a refrigerator, and a coffee maker. Guests of Holiday Inn & Suites Chicago - Downtown have access to an outdoor pool, a 24-hour health club, and free WiFi in public areas. Valet parking is available for USD 50.00 per night, and there's also limo/town car service. Multilingual staff at the 24-hour front desk can assist with luggage storage, dry cleaning/laundry, and concierge services. Additional amenities include conference space, a 24-hour business center, and a seasonal outdoor pool. friendliest staff - convenient location. Buffet breakfast is served on weekdays from 6:30 AM to 11 AM and on weekends from 7 AM to noon for a fee. Sunnys Bar and Grill - Restaurant and bar specializing in American cuisine. Open daily for breakfast, lunch, and dinner. Kid's menu available. Recreation features at Holiday Inn & Suites Chicago - Downtown include an outdoor pool and a 24-hour health club. Guests under 16 years old are not allowed in the swimming pool or fitness facility.